Hi, GApps (Google Apps) are not pre-installed on CyanogenMod, Lineage OS, custom Android 9.0 Pie, Android 8.0 Oreo, Android 7.0 Nougat, Android 6.0 Marshmallow, Android 5.0 Lollipop and any other custom Rom. This is a GApps (Google Apps) installation guide and here is an easy and safe tutorial for install Google Apps. 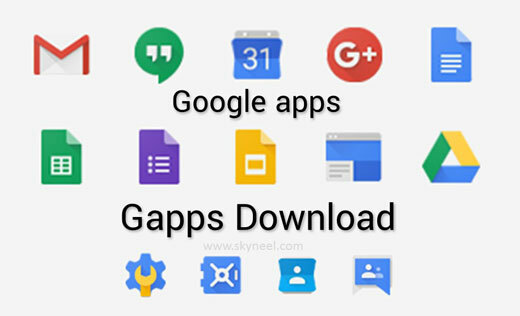 Gapps (Google Apps) is a set of the Google application which is by default already installed in the Android phones. By default Google Play Store, Google Talk (Text to Speech), Google Sync, Google Maps, Google Backup, Gmail, Google Search, etc already installed on your Android phone. If you have any customer ROM but don’t have Gapps then you can read this guide how to download Google Apps for your Android phone. By default there are lot of inbuilt Google Apps already installed on your Android phone like Google Play Store, Google Talk , Google Sync, Google Maps, Google Backup, Gmail, YouTube, Google Search, Google Voice Search, Google Music, and Google Docs. But most of the Android experts and developers ready to do lot of experiments on his Android phone. All these guys know very well what is the Gapps and how to download Gapps for any Android phone. During developing any custom ROM you need Jelly bean Google Apps, KitKat Google Apps, Lollipop Google Apps, Marshmallow Google Apps, Nougat Google Apps, Cyanogenmod Gapps, Lineage OS Gapps, you must have to delete default apps from Android phone. After deleting the Gapps-pack you will get much better phone performance, faster speed and many more on your Android phone. Gapps provide better experience for your Android phone. There are few important and essential apps which is deleted by the developers and you want to get then back. Because few deleted apps are important for us and you can install these apps with the help of different Gapps packages on your Android phone. There are lot of Google apps packages discuss in this guide you can read them and then install these apps as per your need. Android phone’s are too much popular in whole country because it allows you to customize your device, set the permission, rights as per your need. 1. You can install required apps as per the Gapps packages. 2. If you choose minimum Google apps package then you can install manually Google apps from Google play store on your Android phone. 3. If you choose minimum Google apps as per the package then internal storage space will be increased. 4. If you choose minimum Google apps then you free more RAM and your phone is running faster. There are four types of platforms for which Gapps (Google Apps) are prepared. As per your requirement you have to download and install particular version of Gapps on your Android phone. 1. ARM – It is used for 32 bit devices. 2. ARM64 – ARM64 is used for 64 bit devices. 3. x86– x86 is used for Intel 32bit smartphones. 4. x86_64bit – x86_64bit is used for Intel 64bit smartphones or few Android emulators. Most of the newly person are confused during selecting the Gapps packages type. So, first you must have to know about the Gapps packages and download the required one on your Android phone. The Gapps Aroma is a special package which allows you to choose which app you want to install or which are not without having the manually writes on Gapps config file. But i would like to inform you that Aroma pack has few issues which may be vary in different devices. The Gapps Super package has core Google system base, Offline speech files, Face detection, Face Unlock, Google Exchange Services and Google Play Store. Google Exchange services is used to replaces the stock/AOSP exchange services. There are following Google Play Store applications list this package are listed below, have a look. The Gapps Stock Pack is used by all those users who are using current generation devices. Due to the package sizes legacy device owners have to use Mini or Micro modular Gapps. The Application list of this package are listed below. The Gapps full pack is designed when you want to use stock or AOSP apps on your Android phone. In this type of package you will get core Google system base, Offline speech files, Face detection, Face Unlock, Google Exchange Services and Google Play Store. Google Exchange services is used to replaces the stock or AOSP exchange services. There are following Google Play Store applications list this package are listed below, have a look. If you want to use limited Google apps then you have to use Gapps Mini Pack on your Android phone. You will get core Google system base, Offline speech files, Face detection, Face Unlock, Dialer Framework, Google Exchange Services and Google Play Store in Mini Pack. Google Exchange services is used to replaces the stock or AOSP exchange services. There are following Google Play Store applications list this package are listed below, have a look. If you have small system partitions on your legacy device or want to use minimalistic approach of apps then you have to use Gapps Micro Pack on your phone. There are following Google Play Store applications list this package are listed below, have a look. Gapps Nano Pack allows you to use minimum Google apps like Okay Google and Google search support. In this pack you will get the following apps list, have a look. 1. All Pico Pack applications. If you want to use absolute minimum Google apps then you have to use Gapps Pico Package on your Android phone. You will get core Google system base, Dialer Framework, Google Calendar Sync, and Google Play Store in Pico Package. There are following Google Play Store applications list this package are listed below, have a look. Step 1: Download GApps (Google Apps) zip file, then connect your phone to PC and copy downloaded zip files into your Phone Internal Storage. Do not copy downloaded zip into any folder or SD card!! Step 2: Now shutdown your device and long press volume down and power button to recovery mode. See in this image. Step 4: Now, Go to main menu and click on Install option. then locate downloaded GApps zip. select downloaded file and swipe to confirm Flash. installing process is start. Don’t interrupt this process, it might to take 1-2 minutes. I hope you like this GApps (Google Apps) installation guide from which you will be able to easily install Google Apps without any extra efforts. If feel any problem in this guide then please use comment box. Thanks to all.